The Urban Alliance on Race Relations (UARR) was pleased to support this important forum on education and identity organized by Positive Change TO . This event was attended by a cross section of the Somali diaspora in Toronto as well as educators, community organizers, young people, parents and community members. UARR was represented at this event by our president Gary Pieters and Past President Sharon Simpson, who attended and interacted with participants. The focus of the discussion was on Somali identity in an increasingly diverse society. The main focus was on schooling and education and the presenters all shared various ways in which younger members of the community must be provided with all of the opportunities, resources and network of support needed for them to achieve their aspirations. Overall, this conference was a wonderful opportunity to ‘build bridges’ and demonstrates the possibilities that can be leveraged as the community places a strong and consistent focus on the uplift of the young people in the quest to reach their full potential. language play in the identity of Somali-Canadians? 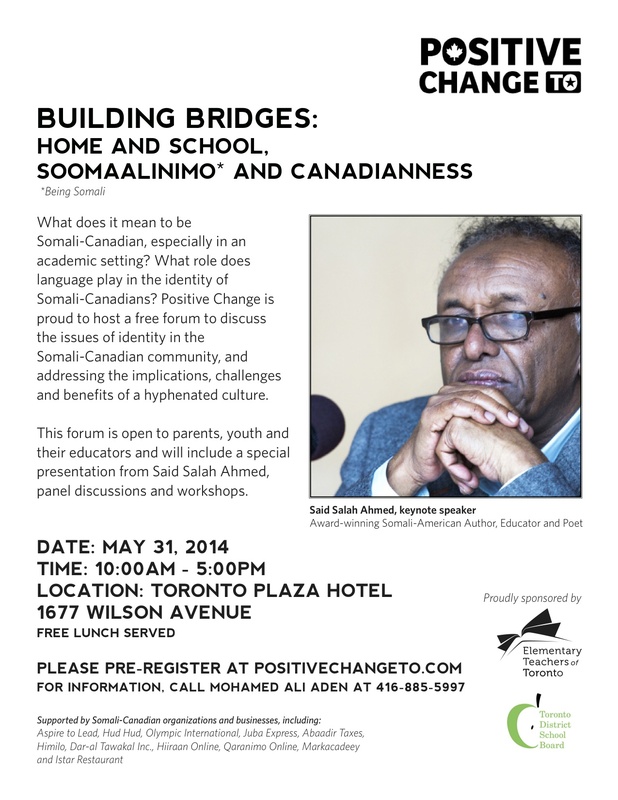 Positive Change is proud to host a free forum to discuss the issues of identity in the Somali-Canadian community, and addressing the implications, challenges and benefits of a hyphenated culture. This free forum is open to parents, youth and their educators and will include a special presentation from Said Salah Ahmed, panel discussions and workshops.